The conference information is now archived. Visit the Agenda page for copies of the presentations. Agenda Mobile Friendly ~ Click here. Our summer conference will be in Portland, Maine from July 9 at 1 p.m. through July 12 at noon. We will be staying at the Holiday In at the Bay. The NASS room rates are $199. Rooms will go fast, so make early reservations. To make reservations, call 1-800-345-5050 and identify yourself as part of the National Association of Secretaries of State Summer Conference to receive the group rate. Hope to see you there! Greetings from the 2015 Summer Conference Program Committee! Have you made your reservations to attend this year’s conference in Portland, Maine, from July 9th through the 12th? Early registration ends on Tuesday, June 9, so please get your registration in. Are you wondering how Connecticut’s Regs Modernization project has progressed since we heard about it last year? We’ll get an update. The publishers in attendance will tell us what they do with our register and administrative codes. John Martinez will give us federal updates. If you have any suggestions or want to present something to the group, please let us know. We look forward to seeing everyone in Portland next month. Please Note: Attendees representing a company that are NOT a NASS corporate affiliate or conference sponsor should register as “corporate non-members” or contact Stacy Dodd at (202) 624-3525 about becoming a NASS Corporate Affiliate. If you sign up as a corporate affiliate or corporate non-member, please contact an ACR officer as your name does not appear on the ACR registration list. Reserve your room now! Book early. The NASS/ACR group rate at the Holiday Inn by the Bay is $199 per night for a double room, $209 per night for a king room (based on availability) and $214 per night for an executive room (based on availability) plus 8% room tax. Please book early to ensure you secure a room. You must make reservations by June 8, 2015, to receive the discount rate. To make reservations, call 1-800-345-5050 and identify yourself as part of the National Association of Secretaries of State Summer Conference to receive the group rate. This discount rate is available for the meeting dates based on hotel occupancy levels. Room reservations must be cancelled by 6 p.m. on the scheduled arrival date to avoid late charges. This committee is charged with putting together the summer conference agenda and contacting presenters. The chair introduces speakers at sessions and procures sponsors for ACR breaks and events not on the NASS schedule. This committee reviews Colborn Award submissions; prepares retirement proclamations and certificates of appreciation. This committee maintains the ACR website with updated posts. Background: ACR Emeritus President Scott Cancelosi emailed proposed amendments to the bylaws to the ACR Listserv on June 5, 2014, and emailed revised proposed amendments on June 23, 2014. The amendments were discussed at the annual conference first business meeting on July 14, 2014, and due to significant discussion were tabled at the second 2014 business meeting. The 2015 Committee have proposed the following amendments based on feedback in 2014 and 2015 – See the proposed amendments here. 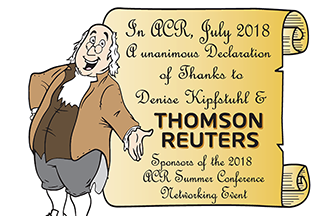 ACR Thanks Our NASS EVENT SPONSORS! Thanks for attending our ACR Sessions!